I love writing about the animals. Once or twice I've even thought about writing from the mind of a cat - a sort of Day-in-the-Life piece. And I've always wanted to write about cat tummies, and the deeply significant feline ritual of showing ones tummy to the human world. 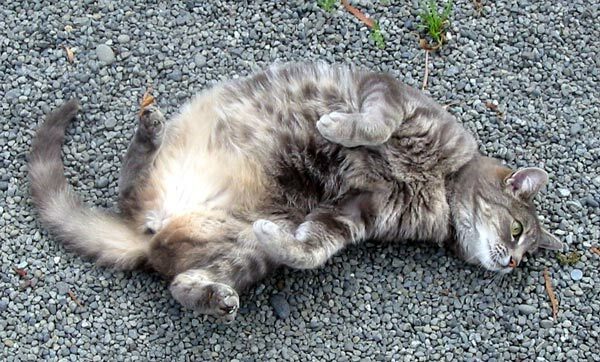 When Jerome the cat (who follows me around the garden) does her cat-roly-poly act in the afternoon heat, I'm quite envious of her flexibility. I bet it feels really good, gravel on fur on backbone, when the temperature is just over thirty degrees. It's the same reason that Stumpy likes to lie in the jigsaw box - a sort of self-inflicted skin/fur massage. And the cat tummy exposed to a cooling breeze, all stretched out - that must be a good feeling too. 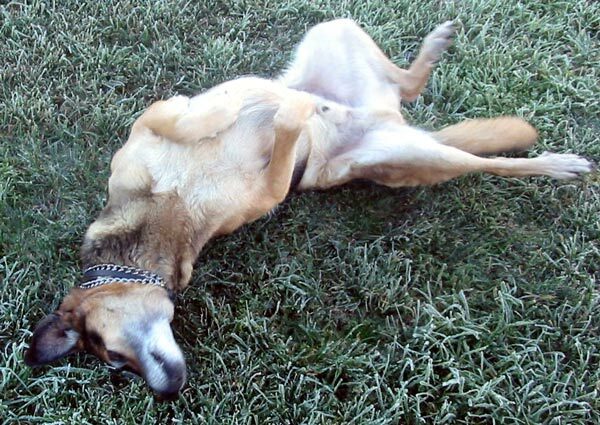 Taj-dog has no style - he needs grass to roll on before he'll show his tummy. But it's a shallow ritual devoid of ancient symbolism - merely a back scratching exercise. He doesn't need his humans to watch him, either. Of course dogs have never been as subtle as cats. 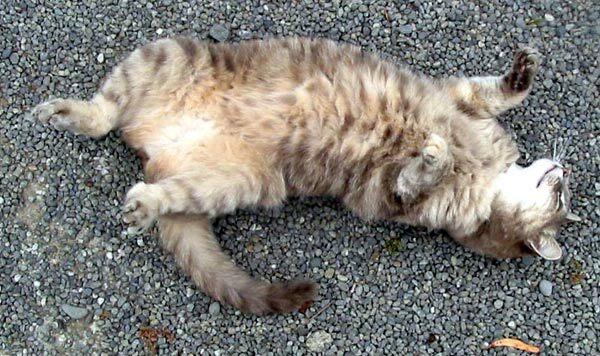 I see a lot of cat tummy displays. We have a strange late summer evening ritual where all three show off, one after the other, like a silent trio of furry break-dancers. The audience (me) makes appreciative noises about the prettiness, spottiness, furriness etc. of each tummy in turn. Both my grey cats will allow tummy tickling sessions which can last forever. Mugs isn't so keen on human intervention, and when Sifter cat was here he would put holes in the offending hand. Mind you, he had the most beautiful spotty tummy of all - and perhaps, not being female, he had more modesty?